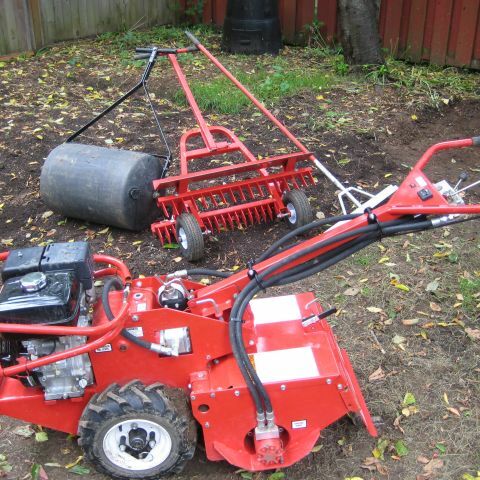 Manual lawn rollers are used as immediately before seeding a new lawn or immediately after laying new sod. 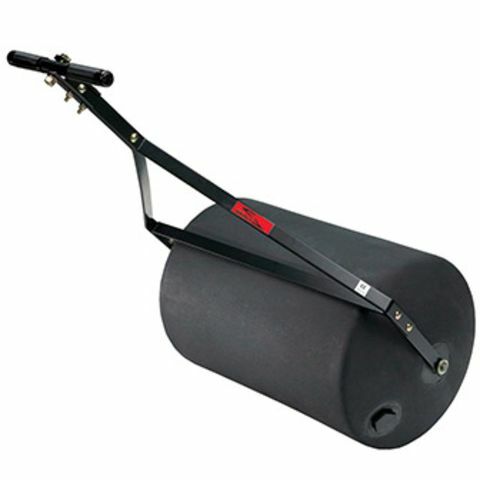 The roller is great for leveling the surface and ensuring a good binding of sod roots and the underlying soil. Simply fill the hollow 18-inch diameter, 26-inch roller halfway with water and roll the lawn roller rental "across the grain" of the lengths of sod. This plastic barrel can hold 250 - 300 pounds of water when fully filled, although the only time the roller usually is fully filled is to smooth out high and low spots on established lawns. If you're laying a new sod lawn, make sure that you've fully completed the sod installation before you use the lawn roller rental. Inspect the sod and fill any gaps between sod lengths with a moist mixture of potting soil and soil from on-site. DO: Use the roller across the grain of sod lengths, not lengthwise. Use after tillering to do a light compaction of the of the soil. The goal is not re-pack everything you just loosened up with the tiller, but to help identify any high or low spots that need to be re-address with the rake or tiller.